There are three opportunities to inspect the state of in-service grease. 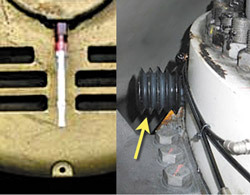 One is by disassembly (such as by removing the bearing cap), the second is by sampling the grease using a probe (ASTM D7718), and the third is by examining the purge discharge. The purge discharge is the grease that’s extruded from exhaust ports, seals and other openings during relubrication or machine operation. Not all grease-lubricated machines have a purge stream, but many do. Machines (mostly bearings) that purge grease provide a valuable opportunity for inspection. The opportunity is significant because of the frequency and simplicity of the inspection. 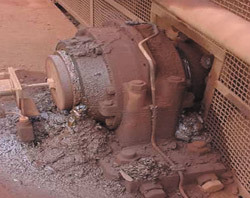 Machines that purge are generally “total loss” systems, meaning the grease is not recovered for reuse but instead is discharged to a catch-pan, trap, grease thief, exterior surface or straight to the floor (Figure 1). A grease discharge trap (GDT) is a perfect inspection device. One version of the GDT uses a simple barb fitting that is installed in the purge port (also known as a drain port, vent port or exhaust port). A 1½-inch zip-lock plastic bag (of various lengths) is positioned on the barb side of the fitting using an O-ring (see photos on the right). Grease that purges out of the fitting goes straight into the bag for easy inspection, disposal and sampling. Cleanliness - Purged grease is contained in the bag and not dispensed to the ground, floor or side of the machine. Disposal - Once the bag is full, it can be removed, sealed (using the zip-lock) and discarded. It is replaced with a new bag. Contamination Control - The machine is protected from contamination ingestion through the purge port during normal thermal air exchange and wash-down sprays. Unobstructed Purge Path - During machine operation, grease can freely purge to the trap to avoid excessive grease volume buildup in the bearing (heat generation and premature bearing failure). Inspection of Grease Discharge Volume- The trap enables easy inspection of the amount of grease discharge (too much or too little) from auto-lubers and manual lubrication practices. Inspection of Grease Condition - Look at the color of the grease including mixed colors (cross-contamination). Touch the grease through the bag to inspect for solids, grit and grease consistency. Slide a strong magnet on the outside of the bag to attract large wear particles. Grease Sample - Remove the bag with the grease discharge sample. Zip it tight, place in a sample bottle and send to a lab for analysis. In many cases, purging grease through a bearing is not recommended, although it is commonly practiced. The decision to purge or not to purge should not be trivialized. To understand this better, see the sidebar below about purge versus volume control methods for lubricating bearings. Too often the opportunity to inspect grease discharge is dismissed largely due to ignorance. In fact, there is a story to tell from the condition and state of grease discharge. This relates both to the state of lubrication and the health of the machine. There is also information to be learned about the application of the grease, the relube frequency and the relube volume that can be assessed by inspecting grease discharge. The discharge from bearings and other machine components is basically a sample of the grease condition as it exits (its terminal state). It carries out a historical account of the bearings. This includes debris from the bearing, contaminants the bearing was exposed to and degradation byproducts from the grease. The state of the discharge correlates to the quality and state of lubrication and ultimately the reliability of the bearing. Figure 2. This is an example of excessive lubrication. Wrong or Mixed Grease - A wrong or mixed grease color can be observed in the discharge. An incorrect grease consistency might also be detected. Degraded Grease - Evidence of oxidation (tar-like), thermal distress and/or dry, caky grease (oil loss) may be visible. Contaminated Grease - Signs of water, corrosion, dirt or other impurities can be seen. Inadequate Grease Volume or Frequency - This is shown from prematurely degraded and/or contaminated grease. 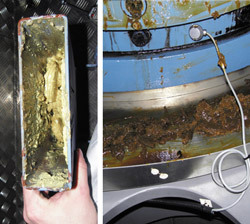 Excessive Grease Volume or Frequency - Large piles of grease discharge reveal problems (Figure 2). Bearings are often lubricated using a grease gun until a fresh grease purge is observed. While there are many cases when this is best practice, there are an equal number of cases when it is not. Anyone who lubricates bearings with a grease gun should understand the alternative methods and when each should be applied. Of course, the machine or component manufacturer should always be consulted. Cake-lock Conditions - The telltale sign of this condition is when the catch-pan only has oil. This means the thickener is binding up in the bearing. Abnormal Wear Conditions - Visible evidence of wear debris is seen. Use a magnet to extract larger wear particles. Solvents can also be used to separate particles from the grease. Obstructed or Diverted Purge Path - The normal amount of grease discharge is not observed, meaning that grease is being diverted to another purge path. Auto-Lube Malfunction or Neglected Grease Gun Relubrication - The normal amount of grease discharge is not seen, resulting in a potential starvation condition. A quick, daily visual inspection is sometimes adequate. Look for abnormal grease discharge, color, consistency and location. Clean away the discharge so the amount of new discharge (since the last inspection) is easily recognized for inspection. Alternatively, use a simple grease discharge trap (see sidebar above). A discharge trap is a plastic bag, grease thief or bellows device connected to the purge port (Figure 3). Grease exhaust is held by the trap for later inspection, sampling and/or disposal. Figure 4. 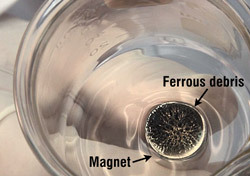 A magnet placed under a gold pan or glass bowl can enable you to observe ferrous debris in a grease sample. Lab Analysis - Many oil analysis labs can also analyze grease. Common tests include ferrous density, elemental spectroscopy, Fourier transform infrared (FTIR) spectroscopy, Karl Fischer, oil content, analytical ferrography and others. Artist Spatula/Light Table Inspection - Use a common artist’s spatula to spread grease across a smooth glass surface. Is the grease soft, buttery, gummy, tar-like, crusty, cake-like, stringy or inconsistent in color? Shining a strong light from below the glass can help you identify clumps, wear debris, contaminants, etc. Particle Inspection - This can be done using solvents (e.g., toluene, mineral spirits, petroleum ether, etc.) to break down the grease. Separate the particles for visual or microscopic inspection by employing a gold pan, patch test or ferrogram method. Ferrous Density - Put some of the grease in a sample bottle along with solvents. Tape a strong magnet to the outside of the bottle and then shake. Observe the ferrous debris collection against the magnet. You can also place a magnet underneath a gold pan or glass bowl (Figure 4) and swirl. Oil Content - Load some of the grease sample in a small bushing the size of a thick wedding ring. Place this on blotter paper and examine the amount of oil that wicks out into the paper over a couple of hours. The damp zone relates to oil content. Try this with new grease first. The routine inspection and analysis of grease discharge should be a part of the skill set of operators and technicians responsible for lubrication, maintenance and machine reliability. The discharge carries bits and pieces of potentially valuable information. This could range from a clean bill of health to the remnants of a building internal machine graveyard.